Boston Acoustics Hsi 270. In-Ceiling Speaker. 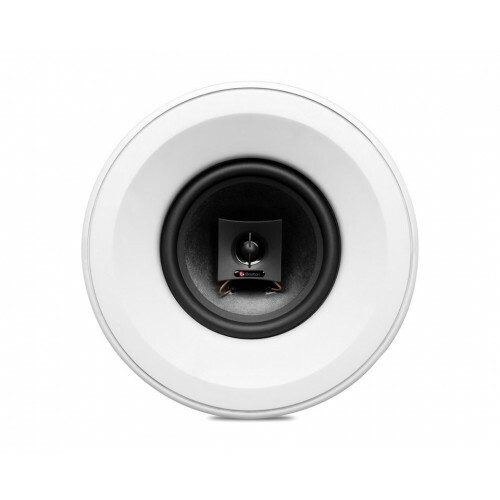 A treated paper cone with a diameter greater than the HSi 250 allows the HSi 270 to offer a surprisingly rich and well defined bass response in both residential and commercial spaces. On the other hand, the assembly of the tweeter in a plate located in the center of the assembly ensures a generous dispersion of the sound from all kinds of positions. A perfect choice for demanding integrators. 2-way / 2-speaker ceiling system. Transducers with exclusive Boston Acoustics technology. Tweeter mounted on a floating plate to improve dispersion. Frequency response of 65-20,000 Hz, +/- 3 dB. Nominal impedance of 8 ohms. Sensitivity of 90 dB / W / m.
Recommended amplification power between 10 and 90 watts continuous. External dimensions: 262 mm in diameter. Cutting dimensions: 225 mm in diameter and 100 mm in depth.